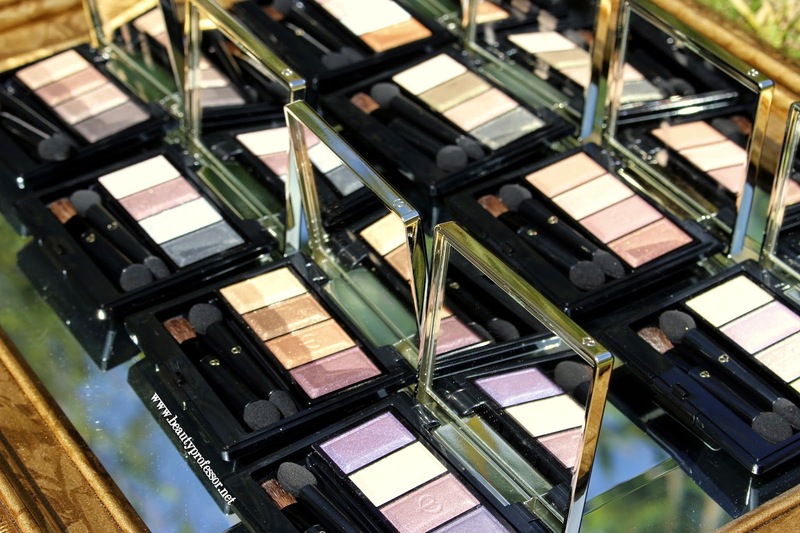 Above: A cavalcade of Cle de Peau Eye Color Quads, patiently waiting to be swatched. 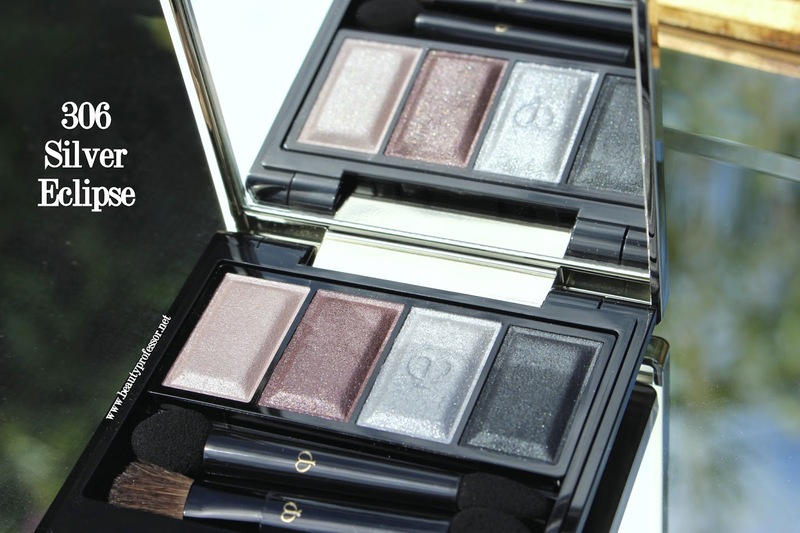 I recently concluded a swatching extravaganza aptly focused on the stunning Cle de Peau Eye Color Quads, currently available at Nordstrom, Saks and Neiman Marcus (will update with a NM link as soon as available). 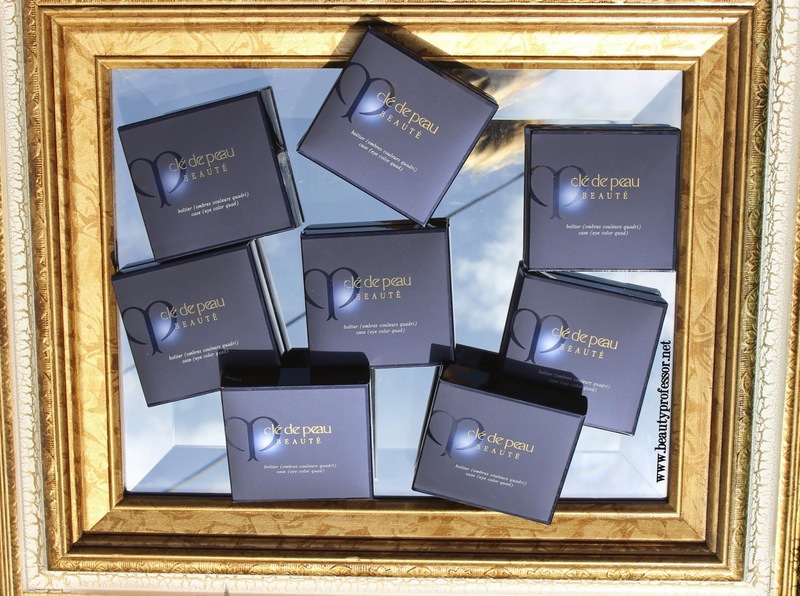 As an integral part of the CdP Fall 2014 La Beaute Celeste color collection, these veritable gems feature four complementary shades nestled the CdP signature navy blue jewel box packaging. 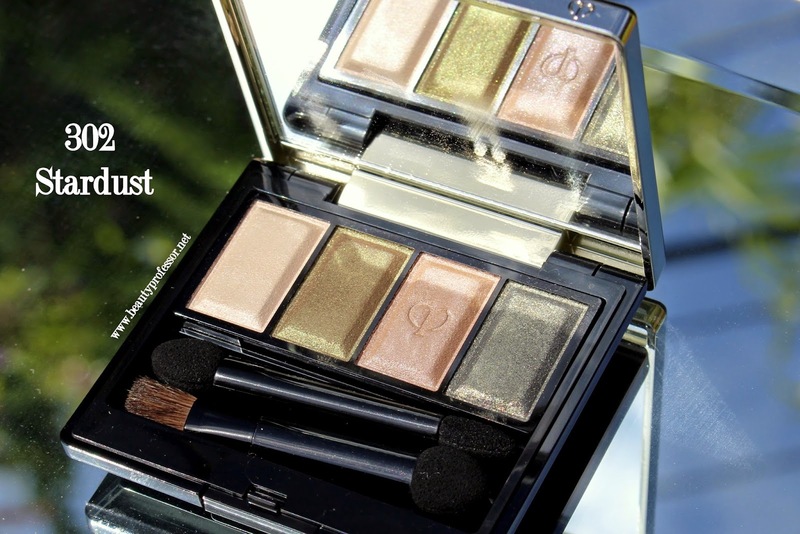 When I mentioned in a previous post that I would be reviewing this formula soon, I was met with a bevy of email requests for me to share initial swatches of the quads, which would ameliorate the challenge of ordering sight unseen. 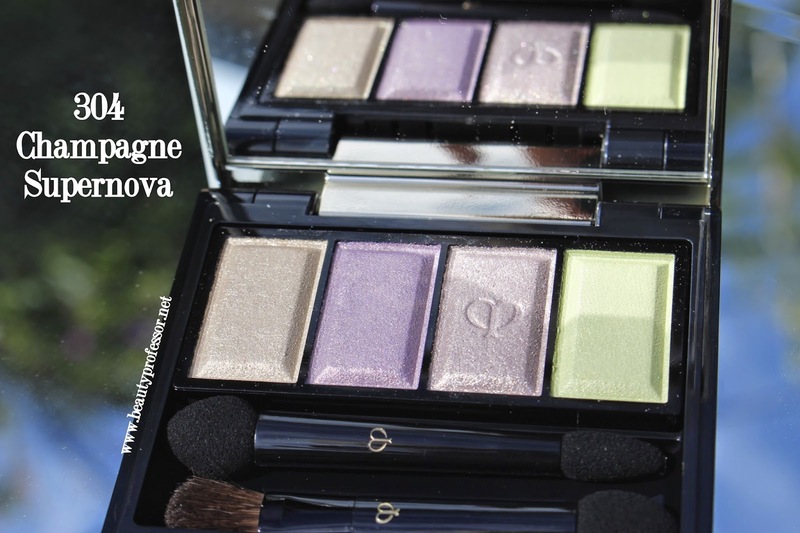 In turn, I am happy to share swatches of all eight quads...I warn you now, these eyeshadows are blindingly beautiful. I will include any additional thoughts as I integrate these quads into looks that I will feature on the blog in the coming days! Above: So much possibility...32 shades worth, to be exact. Each of the eight new eye color quads feature a perfect constellation of four color pairings that illuminate with shimmering tones. Selected by Cle de Peau Makeup Creative Director Lucia Pieroni to reflect the rich colors that radiate within the night sky, the palettes are presented in a beautiful, jewel-like refillable case. 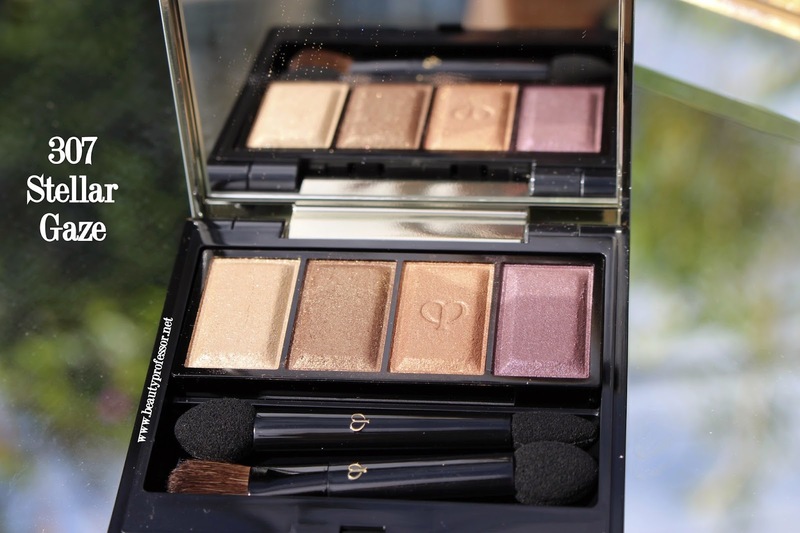 Cle de Peau eye color quads are infused with new Optical Color Formula, which melts into skin for a translucent effect, as well as new IH Powder to correct uneven skin tone and maintain color longevity. Premium Argan Tree Oil helps ensure fade-resistant color and White Lily Extract moisturizes the delicate eye area. 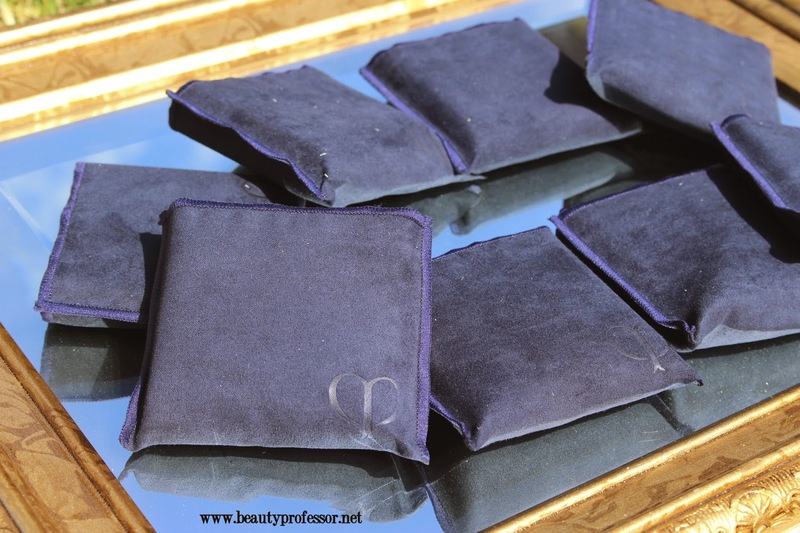 Above: The CdP Eye Color Quad comes in a lovely velvet pouch. #301 Marmalade Sky is a soft and delicate offering with light mauve, pale champagne, shimmering white and warm golden bronze. Above: Swatches of #301 Marmalade Sky in direct sunlight. #302 Stardust is earthy yet cool, with shimmering ivory, a yellow-based pewter, tender peachy taupe and a golden moss green. 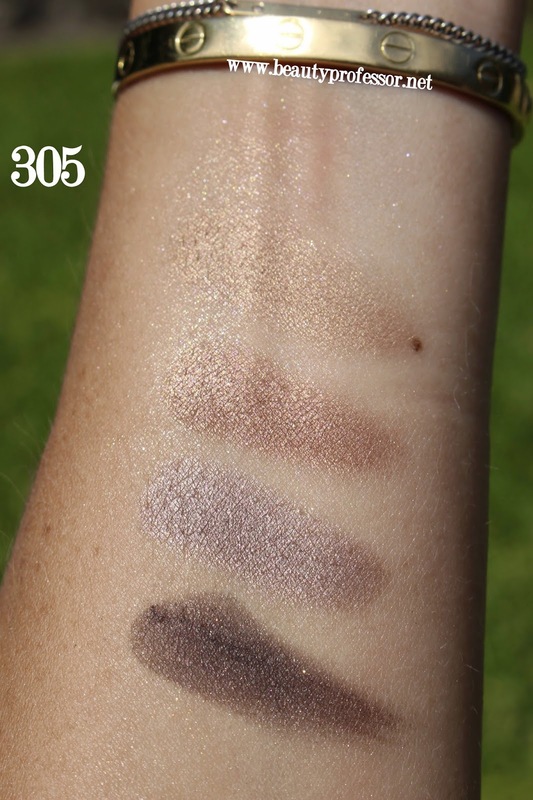 Above: Swatches of #302 Stardust in direct sunlight. 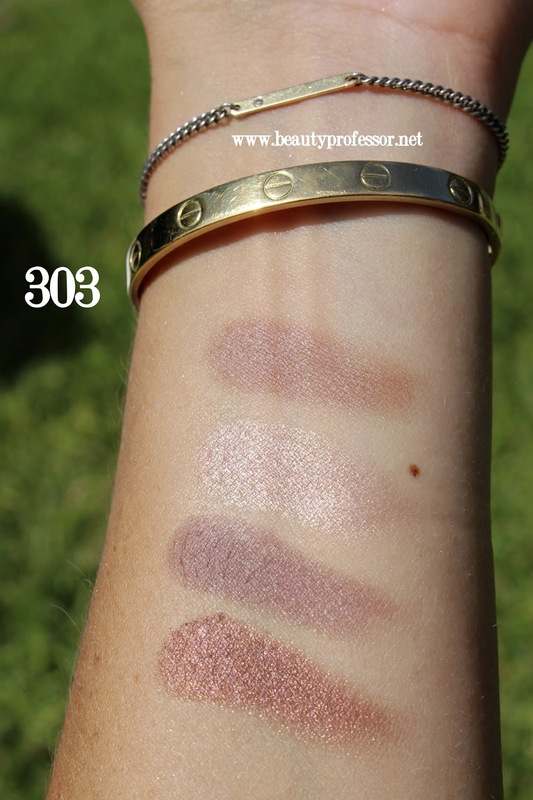 #303 Baby Universe captured my heart in a single glance; this ode to warm neutrals has a rosy taupe, shimmering pink champagne, soft aubergine and muted rose gold. 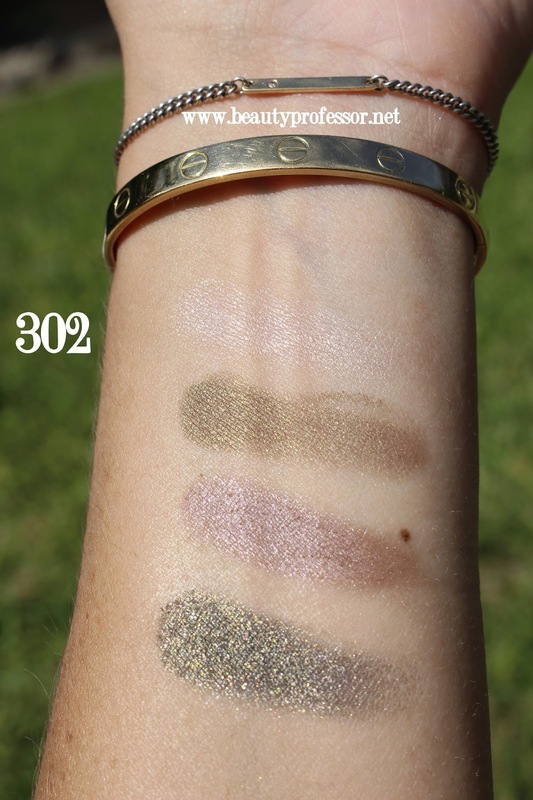 Above: Swatches of #303 Baby Universe in direct sunlight. #304 Champagne Supernova definitely leans cool (and reminds me of the Oasis song, naturally) and includes a icy platinum, pale lilac, uber light silvery mauve and soft lime-meets-peridot green. 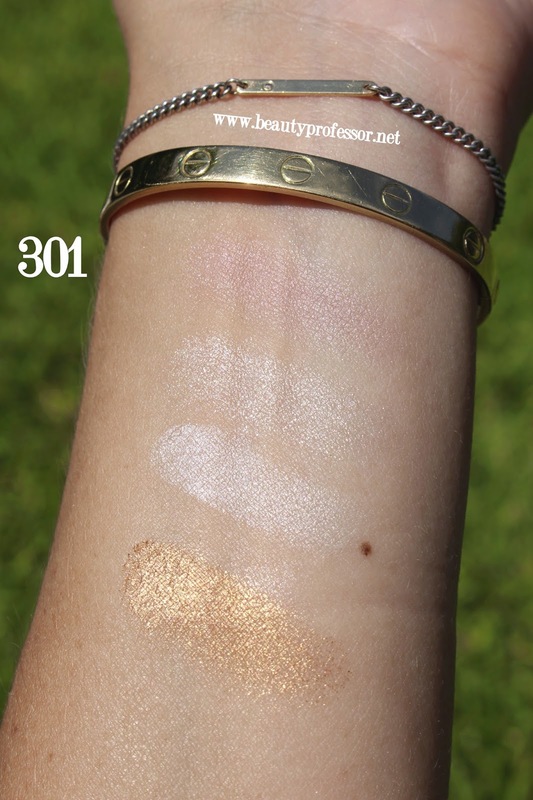 Above: Swatches of #304 Champagne Supernova in direct sunlight. #305 Champagne Moon houses neutral shimmering earth tones including a soft golden beige, bronzy taupe, taupey gray and brownish smoke. 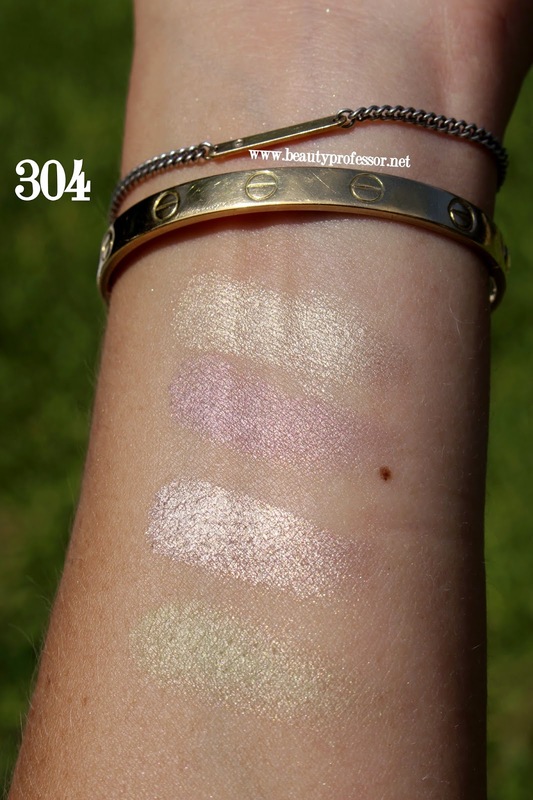 Above: Swatches of #305 Satin Moon in direct sunlight. #306 Silver Eclipse has a name that say it all...cool silver tones abound including a pure pale silver, silver-toned mauve, medium silver gray and silvery charcoal gray. 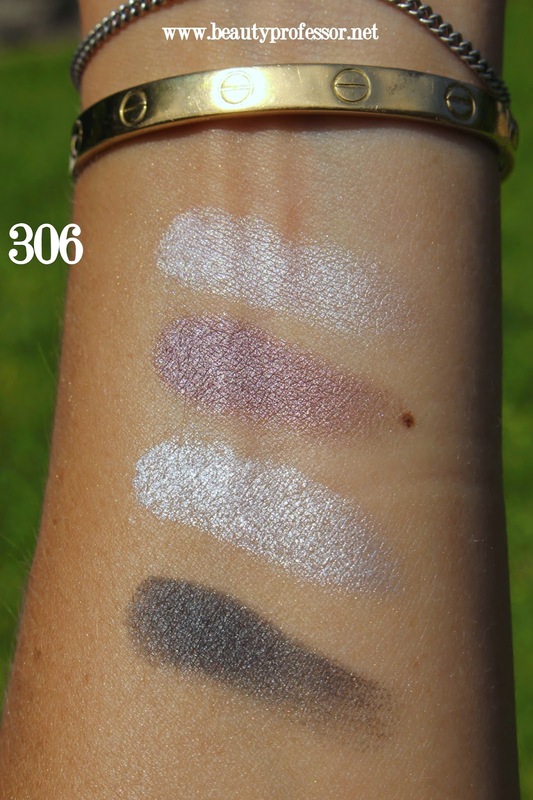 Above: Swatches of #306 Silver Eclipse in direct sunlight. #307 Stellar Gaze is entirely gold-infused with a pale gold, warm medium gold, rust-meets-peach gold and deep purple for accent. 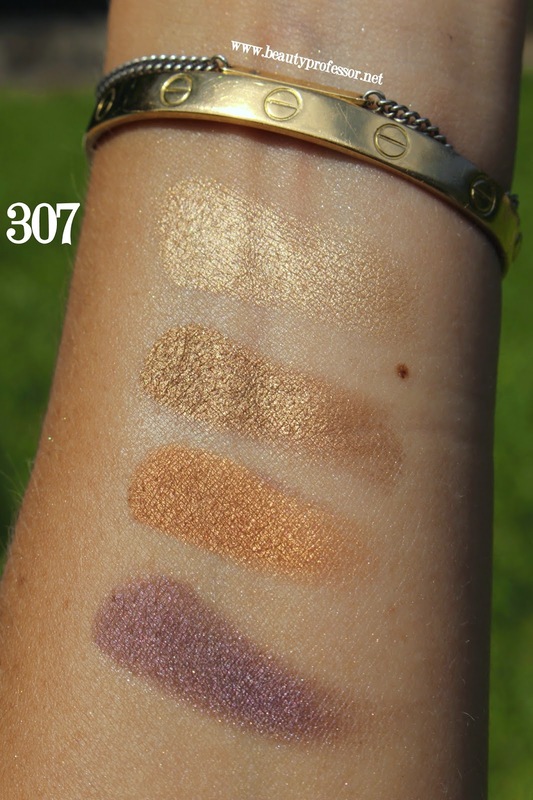 Above: Swatches of #307 Stellar Gaze in direct sunlight. 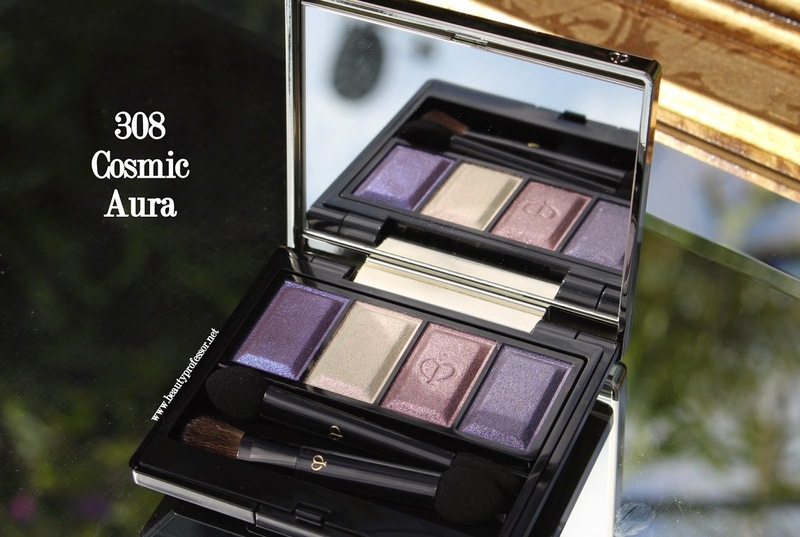 #308 Cosmic Aura is a harmony of purple tones including an iridescent practically-periwinkle, soft pale pink, mauve thistle and deep, smokey lilac. 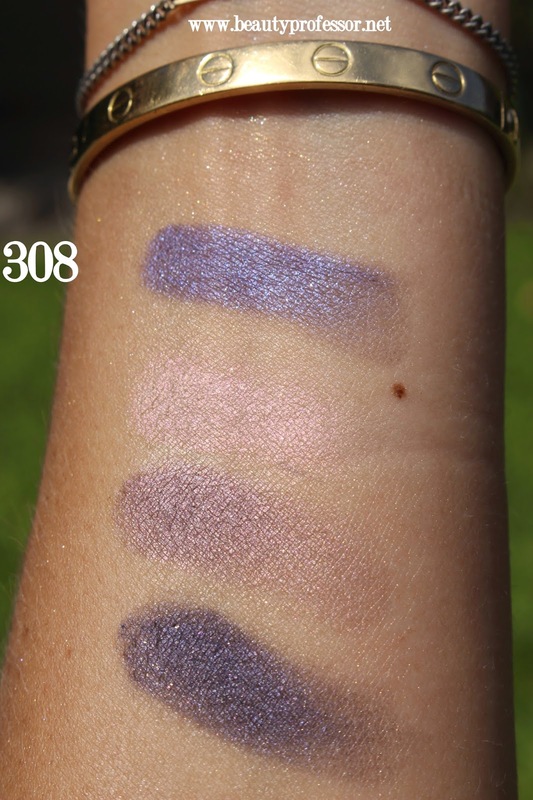 Above: Swatches of Cosmic Aura in direct sunlight. 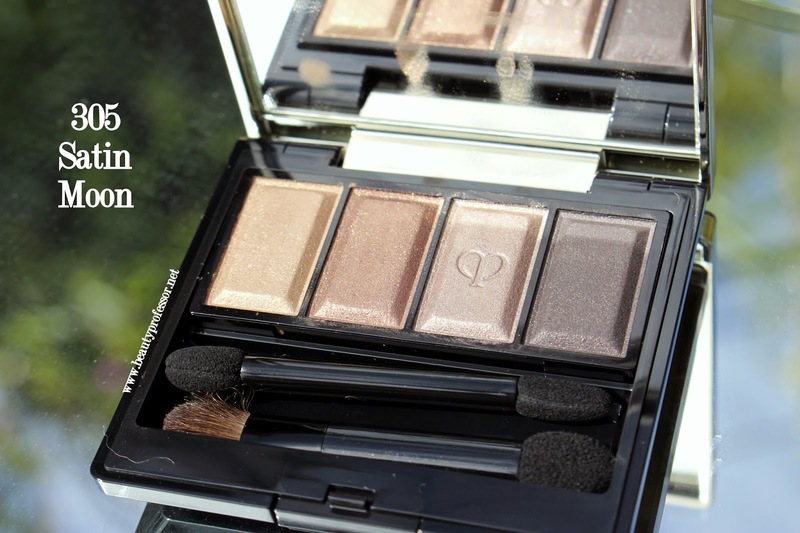 Bottom Line: The Cle de Peau Eye Color Quads (currently available at Nordstrom, Saks and Neiman Marcus) are gorgeous in an otherworldly sense (how apropos!). Buttery smooth, richly pigmented and brimming with lush, light-capturing properties, there is sure to be a befitting option for every individual's unique personal coloring. I am utterly smitten with Baby Universe and Stellar Gaze but will be featuring looks with all eight quads in the near future. These are endlessly wearable and definitely a worthy splurge for fall! Which quad has captured YOUR eye? ** PR sample provided for review however, as always, all of my opinions are expressly and unequivocally my own. I am cle de peau cream foundation O20 with brown eyes, do you think 302 would be too cool for my skin tone?? Thanks much!! My pleasure! I completely understand the need to temper one's splurges ; ) I don't think that #302 would be too cool on you...it is such a unique "cool" palette, using traditionally warm shades with a slight neutral twist. I love it and think it would be beautiful on you! Great swatches as per usual. I am gravitating towards Stellar Gaze and Baby Universe! Wow 303 is absolutely stunning! I have just purchased the UD Naked palette (a bit slow I know) and am really loving it, I'm not much of an eyeshadow person (lack of skills) but I have been wearing it daily. Thank you for the swatches!!! They are soo soo beautiful!! Could you tell me if the refills are sold separately from the case, or together?? Happy to share them, Irena...thank you! Yes, the refills are sold separately from the case...the quads alone are $55 and the refillable case is $25 (making them $80). I had 305 and 308 on my list and I eventually got 305. Lovely eye quad indeed! My pleasure...happy you got and love #305...great choice! Aww Stellar Gaze is seriously so beautiful, but I just splurged on the Chantecaille Save the Bees pallete. Isn't it though? 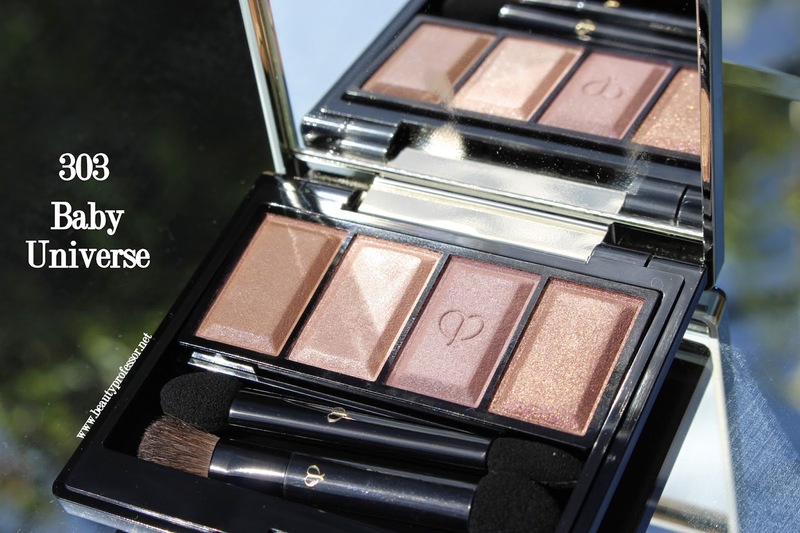 Enjoy your Chantecaille Save the Bees Palette? It is truly lovely as well! Debating whether to buy this quad or the new Chanel, what do you recommend. Haven't had a chance to swatch any of the Chanel but I've heard and read on various blogs that the formula is wonderful. Only thing I dislike about CDP is buying the quad and the compact separate. Oh well, that's just a small gripe for the brand! Thanks for your question. I can't speak to the Chanel Quad since I don't own it, but I have swatched it in person and think that the Cle de Peau is silkier and more pigmented overall. Plus, I really like the color options in this range...unique yet wearable! I understand your sentiments about the separation between the quad and the compact but the good side is you can refill it with different options, depending on the season and your mood! I just did this with a CdP lipstick since the bullets and cases are sold separately as well. Oh wow, these are even prettier than I had imagined! Four of them are going straight to my wishlist! Indeed...hope that they make it from wish list to your home ; ) You will love them! Thanks for the swatches! I'm in love with the 303 Baby Universe and 307 Stella Gaze. One thing I always wanted to see on your blog, is you with the french non makeup look (a light base, a bit bronzer or neutral blush, lip balm, eyebrow lightly done and a bit of highlighter). You could totally pull it of with the great hair you have and your big eyes! Just a suggestion, it could be fun to see. Have a great summer! 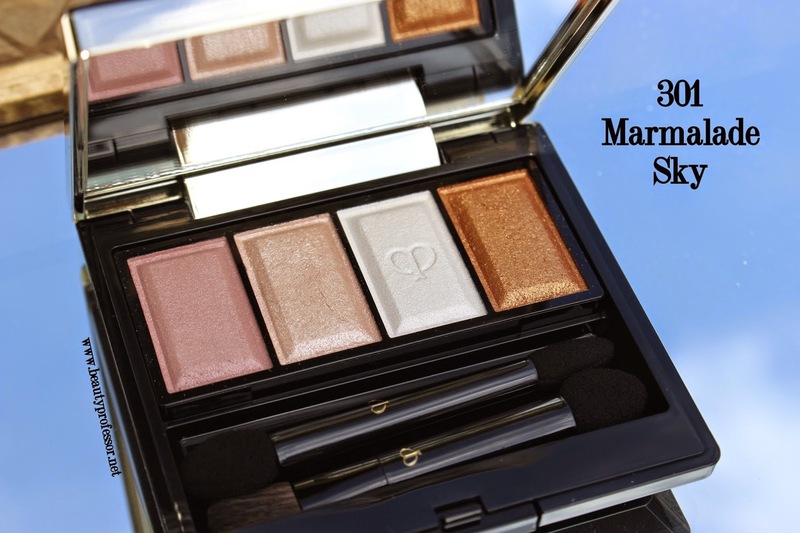 Definitely plan to pick up a few of these during the Barney's beauty event next month! Awesome...the Barney's bag is sure to be a good one! I wish I could help you but, after a quick search, couldn't find any European retailers who sell CdP...what a travesty! Have you inquired about shipping from Nordstrom, Saks Fifth Avenue or Bergdorf Goodman's? I will continue to keep my eye out! Satin Moon, Baby Universe and Stardust... Can I have them all? Baby Universe looks like a precious and highly leveled up-summed up version of UD Naked 3. It directly reminded me of the last half of that pallette. Gorgeous! Yes...aren't they incredible? I am loving Baby Universe and agree it has all the best shades (albeit they are more buttery and pigmented) from the UD Naked 3. It is such a great quad! Video Overview: June 2014 Favorites!